PHOENIX — Arizona’s dove hunters still have time to get out in the field before the 15-day season ends at legal sunset Friday. By now, most white-winged doves have made their annual migration to southwestern Mexico, leaving mourning doves and the invasive Eurasian collared-doves to provide most of the wing-shooting opportunities. As a reminder, there is year-round season for Eurasian collared-doves, with an unlimited daily bag and possession limit. The Arizona Game and Fish Department reminds hunters to review the “2017-2018 Arizona Dove and Band-tailed Pigeon Regulations,” which are posted online at www.azgfd.gov/dove. The regulations also are available in a new format that hunters will find particularly handy in the field. The color brochure is easier to read and features important hunting information, such as season dates, daily bag and possession limits, and legal requirements, at a glance. The printed version is available at all department offices and more than 200 license dealers statewide. A youth combination hunt/fish license is only $5 and includes a migratory bird stamp. 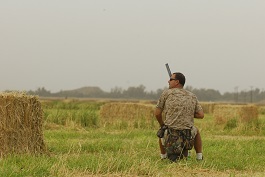 Hunters 18 and older who want to hunt doves and band-tailed pigeons (as well as ducks, geese, coots, snipe and common moorhens) must possess a valid Arizona hunting license, as well as a migratory bird stamp for the 2017-18 season. Both can be purchased online right now at https://license.azgfd.gov/home.xhtml.